CSS Navigation Menu with Pure CSS! 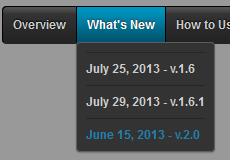 I am a licensed user of CSS3 Menu version 4.5. I am using a PC and Windows7 and MS Internet Explorer. I am using your drop-down menu with a lot of submenu items ("mega-menu"). I will be buying your product shortly. I'm a web designer and could do the coding myself but it saves time this way. Is it possible to change menu color not in the .css file but in the program? I'm trying your Css3menu free version. Is it possible to create the menu where the submenus are all in one row? I have made CSS Menu and published, but where can i find CSS code to use an a website? How do I install on a website ? I have downloaded the free version of your software to see if it is suitable for my needs, before purchasing. Dear Support, I have a horizontal menu with 9 top level items. When i resize the browser to a smaller window, the menu wraps. How can we avoid this so all the top level items are in one line? Really like you Css Menu software. Maybe I am looking in the wrong place but I am trying to work out how to set the "Active" button colors etc. I can see how to set "Normal" and "Hover" but no "Active".